Flu shot is a flu vaccine for preventing influenza; It’s an inactivated vaccine (containing killed virus) that is given with a needle, usually in the arm. All children aged 6 months to their 5th birthday. Adults and children ages 2-64 with chronic medical conditions, especially asthma, other lung diseases, and heart disease. All women who will be pregnant during the influenza season. Health-care workers involved in direct patient care. Out-of-home caregivers and household contacts of children less than 6 months old. Any person who wishes to avoid the flu. Who Souldn’t Get a Flu Shot? People who had history of Guillain-Barre Syndrome. Is There any Side Effects and Adverse Reactions to Flu Shots? 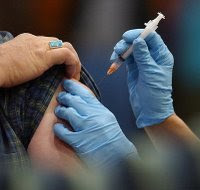 The flu vaccine is made from a virus that is no longer active. Therefore, no one can catch the flu from a flu shot. Less than one out of three people will develop soreness around the injection site for one or two days. Fever, aches and pains are not common and more severe reactions are rare. The flu shot does not increase asthma attacks, according to recent American Lung Association study.